The Pollock-Krasner Foundation, Inc. was established in 1985 for the sole purpose of providing financial assistance to individual working visual artists of established ability through the generosity of the late Lee Krasner, one of the leading abstract expressionist painters and the widow of Jackson Pollock. The Foundation is pleased to report that since its inception in 1985, it has awarded over 4,500 grants totaling nearly 74 million dollars to artists in 77 countries. 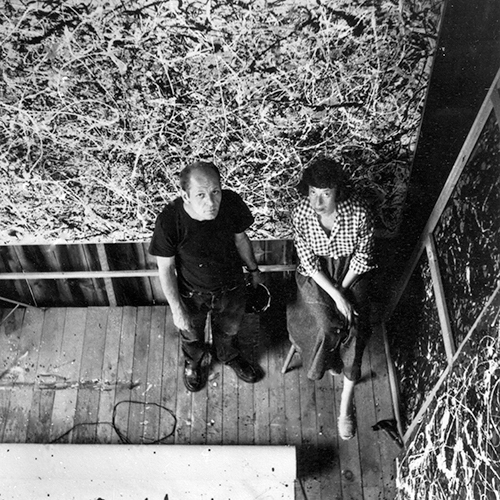 Jackson Pollock and Lee Krasner in Pollock's studio, East Hampton, 1950. Photograph by Rudolph Burckhardt. ©Estate of Rudolph Burckhardt, courtesy Pollock-Krasner House and Study Center, East Hampton, NY. Both artists finished their training just as the Great Depression of the 1930s was devastating the U.S. economy. Millions of people were out of work, and the prospects for young unknown artists were dim. Fortunately Franklin D. Roosevelt’s New Deal administration created employment programs that included workers in the arts, and both Pollock and Krasner took advantage of them. From 1935 to 1943, the Works Progress Administration (WPA) Federal Art Project gave them, and thousands of other artists nationwide, a living wage to do the work for which they were trained. The agency’s non-discriminatory hiring policy was based on artistic merit and financial need. Freed from the demands of the commercial art market, artists made murals, easel paintings, and other works for public buildings. And they experimented with new approaches, paving the way for Abstract Expressionism’s emergence after World War II. 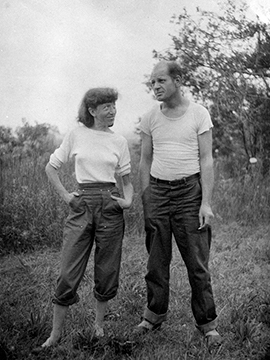 Lee Krasner and Jackson Pollock on their Springs property, ca. 1946. Photograph by Ronald J. Stein. © Pollock-Krasner House and Study Center, East Hampton, NY. Gift of the Estate of Ronald J. Stein. 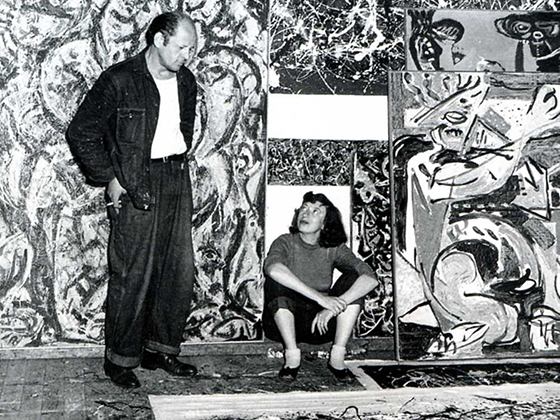 Jackson Pollock and Lee Krasner in Pollock's studio, East Hampton, 1949. Photograph by Lawrence Larkin. © Pollock-Krasner House and Study Center, East Hampton, NY. Used by permission. Lee Krasner never forgot the personal and professional advantages she and Pollock received on the WPA, and was mindful of the lack of such opportunities in the contemporary art world. In planning her legacy, she envisioned a charitable organization that would serve a similar function: to relieve the financial burden on recognized professional artists so they can practice and advance their work. Her prudent management of Pollock’s estate, as well as her own successful career, provided the initial funding to make that vision a reality. 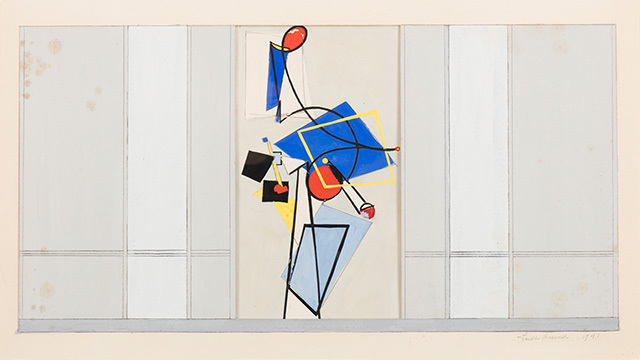 Lee Krasner, Mural Study for Studio A Radio Station NYC, 1941. Gouache on paper, 19 1/2 x 29 in. Courtesy Paul Kasmin Gallery, © The Pollock-Krasner Foundation / Artists Rights Society (ARS), New York. Jackson Pollock untitled, ca. 1938-41. Glass mosaic in cement on wooden support, 54 x 24 in. Courtesy Washburn Gallery © The Pollock-Krasner Foundation / Artists Rights Society (ARS), New York. In 2018 The Pollock-Krasner Foundation celebrates thirty-three years of grant making to individual artists, continuing to fulfill our mandate to aid worthy and needy visual artists internationally. 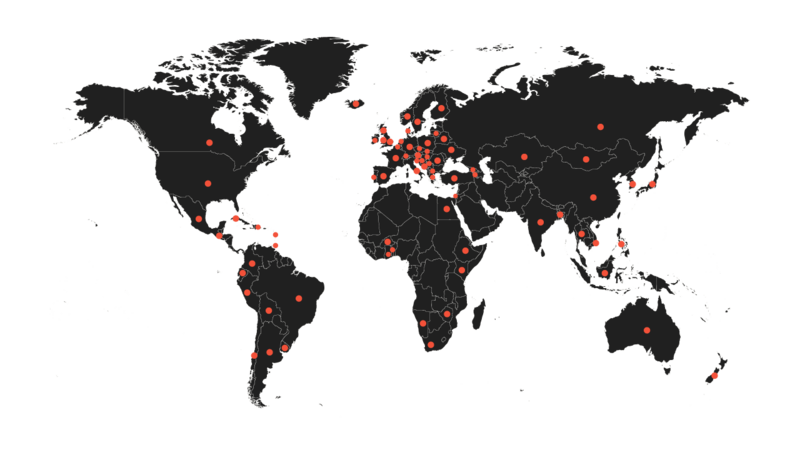 Since our inception in 1985 we have been privileged to award nearly $74,000,000 to over 4,500 grantees in 77 countries. Our grants continue to be utilized for a broad variety of artists’ needs ranging from supplies and casting materials to purchasing medical insurance and other personal needs. We continue to offer to older artists of distinction and achievement, our three-year Lee Krasner Awards as an indication of our respect for their noteworthy careers. We also have instituted an annual award, the Pollock Prize for Creativity, in honor of our thirty years of grant making. Both of these awards are by nomination only. Finally, we are now awarding grants, through a closed nomination process, to fine art photographers. In addition to supporting individual artists, we continue to award grants to outstanding arts organizations or institutions that are making a direct contribution to the well being of artists. In reviewing our three-decade history, we are acutely aware that the struggle of talented artists to stabilize their careers and have time and resources to do their work is a never-ending challenge. While there are instances of increased funding and renewed interest of government support for individual artists here and abroad, the reality is, that this support (whether federal, state, or local) continues to be precarious. There is still a lack of support from foundations, corporations, and wealthy donors toward this end. There is no way that we can adequately express our appreciation to the distinguished men and women who have served anonymously on our Committee of Selection, which reviews all of our applicants’ submissions and advises on artistic merit. This rotating committee, composed of museum officials, artists, patrons, and critics, has demonstrated a cross-cultural expertise in judging contemporary art and is highly qualified to recognize artistic merit from whatever country, style, school, or technique. Finally, on behalf of our Board of Directors, let us express our deepest appreciation and gratitude to our remarkable staff of committed and congenial colleagues devotedly supervised by our Executive Vice President, Kerrie Buitrago. These individuals have made a major contribution to the success, reputation, and impact of our Foundation.